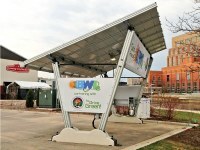 24/04/2013 - The town of Lansing, Michigan, celebrated Earth Day with the installation of the 5 kW solar carport 'Energy-Parking' which will function as EVSE (Electric Vehicle Supply Equipment). The town of Lansing, Michigan, celebrated Earth Day with the installation of the 5 kW solar carport 'Energy-Parking' at the riverside City Market. Tha carport will function as EVSE (Electric Vehicle Supply Equipment). The launch event was attended by Mayor Virg Bernero, which signified the importance of this initiative to the Lansing area. The project for the EV charing station involves the use of EV chargers by Eatonand solar panels by SILFAB Americas, as well as high-tech LED lighting and highly-visible side and top banners. The modular structure was designed to be 100 percent waterproof and fully wind, snow and seismic code compliant. The innovative solar-powered EV charging station is intended to generate enough clean, renewable energy to recharge the car park of the Lansing Board of Water & Light (the municipal utility that provides electricity and water to the residents of the cities of Lansing) for the next 25 years. It will reduce Lansing's greenhouse gas emissions by more than 115 tons and allow more than 300,000 miles of clean driving. “We are committed to helping cities across America deliver their citizens' dreams of a green tomorrow”, said Giulio Barbieri, founder of Giulio Barbieri S.p.A, Ferrara, Italy, “Built right in the heart of the city, where the Cadillac ELR hybrid electric vehicle will soon be assembled, this solar canopy was installed in just a few days without the need for any foundation trenching thanks to its ballasted design. It clearly demonstrates how municipalities can power green fleets sustainably.” “We are proud to bring our Italian innovations to the American market”, said Giulio Barbieri “By combing the capacities of America's very capable workforce with our Italian design, we believe that this sound strategy will reduce our supply chain carbon footprint and speed up our ability to react to this growing market”.